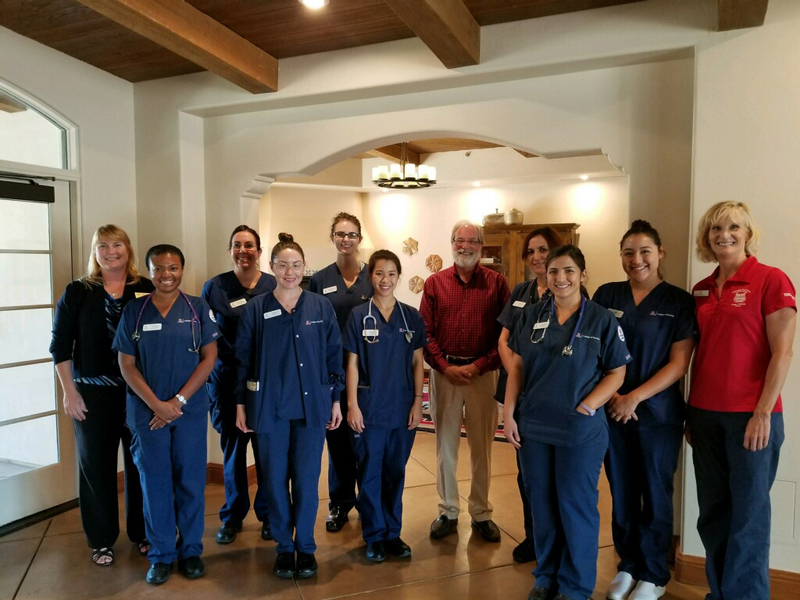 In mid-July, eight Master of Science for Entry to the profession of Nursing (MEPN) program students completed their first clinical rotations at The Hacienda at the River, the latest senior residential community initiated by the Watermark Retirement group. With a focus on independent living, assisted living and memory care communities, the goal at The Hacienda is for residents to advance their personal wellbeing in ways that resonate physically, spiritually and emotionally. The approach is a perfect match for a partnership with the University of Arizona College of Nursing – with its integrative health focus and one-of-a-kind Integrative Nursing Faculty Fellowship (INFF) – and provides a perfect opportunity for students to see how integrative therapies can become a larger part of their practice. I had some idea of integrative health in terms of nutrition and meditation, but I hadn’t been exposed to the therapies at The Hacienda, like hand massage, guided imagery or equine therapy. I felt apprehensive about how the residents would respond to some of the therapies, but they’re actually really open and enjoyed what we did for them. I spent most of my time in assisted living where many of the residents are 90 years or older. I really enjoyed working with them, hearing their stories, talking with them. I really like the way they’re incorporating alternative therapies rather than just going the pharmacological route. And the use of animal therapy was inspiring because animals can do amazing things for the body and the mind. Amazingly, I actually witnessed one resident drop his blood pressure by 30 mm Hg by just being in the presence of a horse. I also learned that an environment can really change a person’s health. If you are really satisfied with the environment that you’re in, it’s easier for you to heal or to stay motivated to engage in healthy behaviors. A lot of the residents were happy with the care that they received and I noticed that the residents all really got along with each other. They just seemed a lot more stress-free and I think that’s crucial for overall health. I didn’t know too much about integrative care before this experience. Learning to incorporate therapies like mindfulness, guided imagery and therapeutic massage into the care that I was giving was really valuable. I was excited and a little bit nervous to finally get out of my bubble, shed my nervousness and provide hands-on care for actual patients – although at The Hacienda they’re called guests and residents rather than patients. I also appreciated the emphasis on self-care for staff, because compassion fatigue and burnout are an important issue in health care. I’m excited that I got this experience because I know that in health care there is pressure to move toward integrative healthcare and non-pharmacological options. My knowledge of integrative health going into this clinical rotation was very limited. Within a medical environment, using a holistic approach to healing typically does not go beyond therapeutic communication; being able to go beyond was invigorating. As a student, I consider being able to experience the environment at The Hacienda such a blessing. Not only is the atmosphere aesthetically pleasing, and the food divine, but the staff are incredibly kind. Working in memory care, I engaged in therapeutic equine sessions with the residents. This proved to be truly remarkable in the promotion of health. As I move forward with my nursing education, I will certainly take with me the therapeutic and evidence-based practices I have learned as an approach to hasten healing for my patients.